WARNING: Post contains graphic pics, but it's probably nothing any parent hasn't seen before. Call us bad parents, but my hubby and I hesitated in teaching the boy how to pull down his pants because we knew it could would lead to one of those awkward moments where he takes his clothes off in public or paints the house in poo. But you can't keep them in diapers forever. That would seriously make dating difficult. So we taught him and keeping positive, I'm proud to see he learned very quickly. 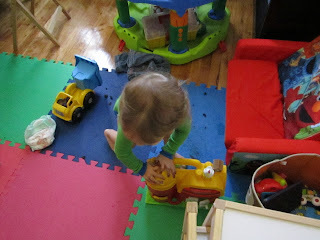 Now normally he's been very good and signing and alerting me when he needs to do a number 2 and we run to the bathroom. He did not do that yesterday. Now I take full responsibility since I should not have gotten sucked into the black hole that is the Internet and I should have been keeping a closer eye on him. But The Wiggles were on and I still heard noises from him - you know it's only REALLY bad when they go completely quiet. Either that or they've passed out on the floor. I mean in terms of the amount of trouble they get into. All the best trouble is done in complete concentration and silence. So I'm in the kitchen on the computer and I smell something. It does not smell right. It does not smell good. 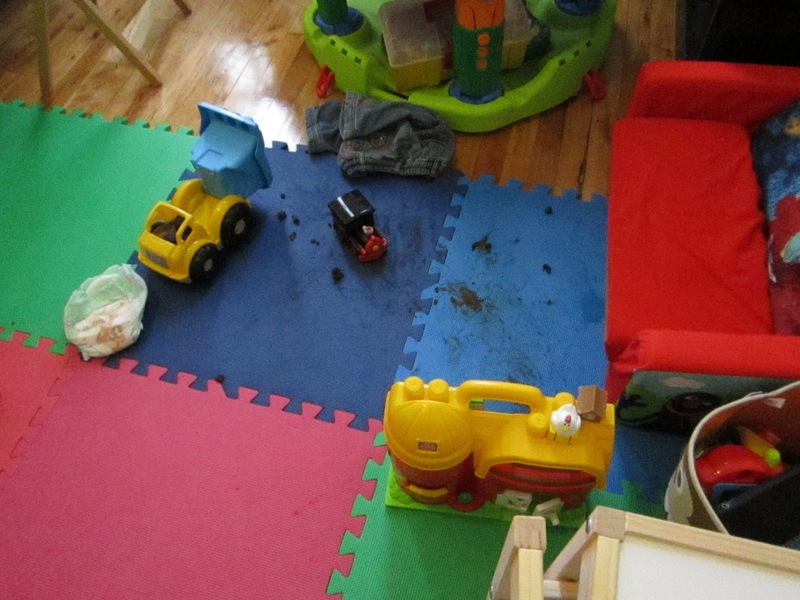 I follow the smell to the living room where I see pants and a diaper strewn off. The odor is horrendous. I see poo pellets. I say, "oh no!" and my son smiles, holds up his poo hands and starts laughing. He gets up to come closer to me. "Oh no no no, don't come near me with those hands! Don't touch anything!" I run for the camera because I know one day this will be comedy gold for a potential high school date night where I embarrass him horribly. I shoved him in the bath (yes, I did eventually have to touch him). That poor black train. He took it and ran it through his poo so many times, well let's just say he gave new meaning to "pulling a load." The train could take no more. Even the strongest stomached person should not attempt cleaning out all the nooks and crannies of that thing. It's electronic, or at least it was - in a former happy life where it could chug away, light up and choo-choo in a poo-free fashion. Now those days are gone and I had to trash it. I am also grateful for those washable playmats, because if poo had gotten squished into the cracks of my hardwood floors, I think I would have died. My sister and I both had some poo-play, so my mom thinks this is the most hilarious thing.